We expect a lot from our organizational leaders these days, from creating a compelling vision that employees can latch onto and accurately assessing the economic landscape to setting organizational culture and performance expectations. If all of that has happened at your organization, don’t think you can sit back and take it easy. Evidence is mounting that another key role leaders need to play is that of teacher, but not in the traditional sense you may be thinking. Back in 2009, Edward Betof, a senior fellow in human capital at The Conference Board (TCB) and program director for TCB’s Executive Council on Talent and Organization Development, published an important book called Leaders as Teachers: Unlock the Teaching Potential of Your Company’s Best and Brightest, published by the American Society for Training and Development (ASTD). In it he argues that if leaders at all levels of an organization aren’t deeply involved in teaching and training efforts, then the organization is failing to make one of the best uses it needs to make of its leaders. Betof is a learning expert, and makes a compelling case for establishing leaders-as-teachers programs that can fully leverage both the experience and expertise of your senior executives, best managers, and in-house experts. Betof is no ivory tower academic pontificating without real-world experience – he put in 10 years as the chief learning officer at medical technology leader Becton, Dickinson and Company (BD). The BD story is especially powerful in how it shows not only the overall positive impact this approach can have on an organization, but more specifically the important boost it can give to the all-too-elusive goal of better succession planning that puts more potential leaders in the development pipeline. The book is powerful testament to the results of leaders-as-teachers (LAT) programming at BD, but there are other examples to highlight as well. Take pharmaceutical giant Merck as an example. What that company does is combine outside expertise with internal experience. Thus, when it wants to teach something like the basics of business finance to employees, what you’ll have are sessions co-taught by an outside finance expert and Merck’s chief financial officer. There’s a significant amount of coordination between the two that needs to happen prior to any co-teaching, but having that expertise combined with the internal context and culture of the organization makes for powerful learning experiences. Johnson & Johnson also took an LAT approach when it wanted to bring issues of diversity and inclusion front and center across its Latin America operations. 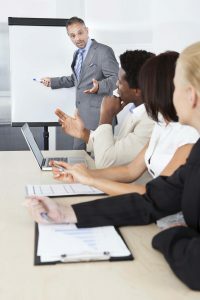 Although it hired an outside company to develop the leaning materials, it then trained J&J’s top Latin leaders to actually deliver the training. When employees see that kind of commitment from top leadership on an issue, they take it much more seriously than when delivered by outside people they don’t know at all. Significant contributions to the development of employees in general and emerging leaders in particular. Strengthening of company culture and communication. Further development of leaders’ leadership skills. Better overall business results and strategic alignment. Improvements in succession planning and career development. Download the free white-paper on Succession Planning – It Begins with Understanding Leadership. Perhaps the best news of all about LAT is that the approach has garnered enough attention and accolades to warrant Betof being joined by Lisa M. D. Owens and Sue Todd to put together a new publication called Leaders as Teachers Action Guide: Practical Approaches for Unlocking Success in Your Organization, just published in June of 2014 by ASTD. It’s full of practical examples like the ones mentioned above along with concrete guidance for how to make LAT happen at your organization.